Can Tropical Weather Systems Affect Minnesota? 48-hour rainfall totals ending 6 PM August 20, 2007, in association with the remnant moisture and airflows from Tropical Storm Erin (path of center shown in lower left of image). Modified from Rowe and Villarini (2013). Every tropical weather season, local climatologists and meteorologists are asked if hurricanes or tropical storms ever have or ever will hit Minnesota. In public settings, this question may draw chuckles, because everyone knows that tropical weather systems are creatures of the subtropical US coasts and cannot affect a northern, landlocked territory like Minnesota, right? It is true that the physics of hurricanes make it extremely unlikely that Minnesota will be hit directly by one. Indeed, we see no traces of storm surge inundation or catastrophic eyewall winds in Minnesota's historical record, and even the most grim of model projections show they have no place in our future either. We have long known, however, that the remnants of tropical weather systems can and do affect our weather, and within the last decade or so we have learned that they occasionally do so with disastrous results. Landfalling tropical weather systems move tremendous amounts of moisture inland. This moisture takes the form of not only the heavy rainfall we associate with hurricanes and tropical storms, but also of exceptionally rich and deep humidity. The weak winds aloft found in the southern US during summer often keep that moisture concentrated over roughly the same region for days on end. The most common effect we see in the Upper Midwest, is that a passing weather system will draw in some of that remnant moisture and increase our cloudiness or precipitation modestly. When conditions are right, however, the remnant tropical moisture can interact with existing ingredients for rain and thunderstorms to create, intensify, and sustain a band of sometimes incomprehensibly-heavy precipitation. The most notable time this occurred in Minnesota was during the record-breaking southeastern Minnesota floods of August 2007, when existing airflows tapped remnant moisture from former Tropical Storm Erin to produce the heaviest rainfall ever recorded in the state. 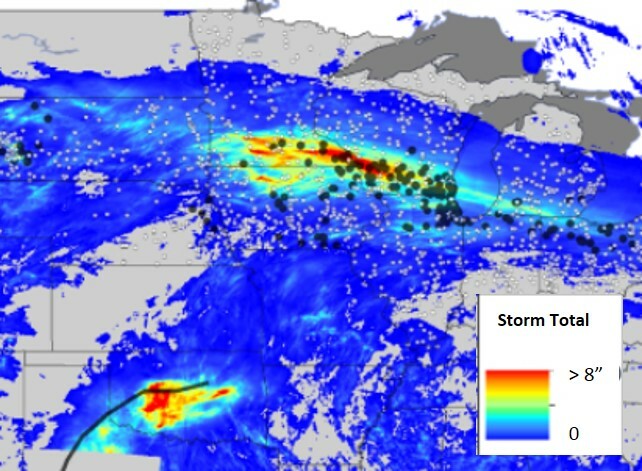 The pattern of heavy rainfall fit what scientists call a "Predecessor Rain Event," which is a widespread, often "banded" area of prolonged, intense precipitation, forming several hundred miles ahead of a remnant tropical weather system.1 In the Upper Midwest, extreme rainfall associated with Predecessor Rain Events is usually well to the left of the track of the center of the former tropical system. In addition to the 2007 deluge, we know of two other tropical-influenced Predecessor Rain Events to affect Minnesota (see table below). Research into these weather phenomena has been very limited, so we do not have a good sense of the which other extreme rainfall events in Minnesota history were affected by tropical weather systems. The three examples we know of all had unusually large footprints of heavy rainfall, in addition to relatively long durations. It is possible that other major events, including one widely believed by climatologists to be Minnesota's worst in 200+ years, also had similar connections to decaying tropical weather systems. Sept 8-11, 1900 Great Galvaston Hurricane Southwest MN to Twin Cities area 2-3 days 7 - 8 20,000 sq. mi. 1 This freely-available study provides a good scientific background on Predecessor Rain Events.